Are you looking for a way to trim that stubborn fat around your core? Are you tired of the same old workout routine on the treadmill or elliptical? If you answered yes to either of these questions, Pilates may be an excellent workout class for you! Practiced by men and women of all ages and shapes, Pilates is a fantastic exercise class that can help you gain muscle, lose weight, and feel great about yourself. Before you sign up for a Pilates class, it may be a good idea to get yourself familiar with some of the basic mat exercises and Pilates techniques. That’s why, in this blog, we’ll look at some popular Pilates moves for beginners so you can be prepared when it comes time to sign up for a class. 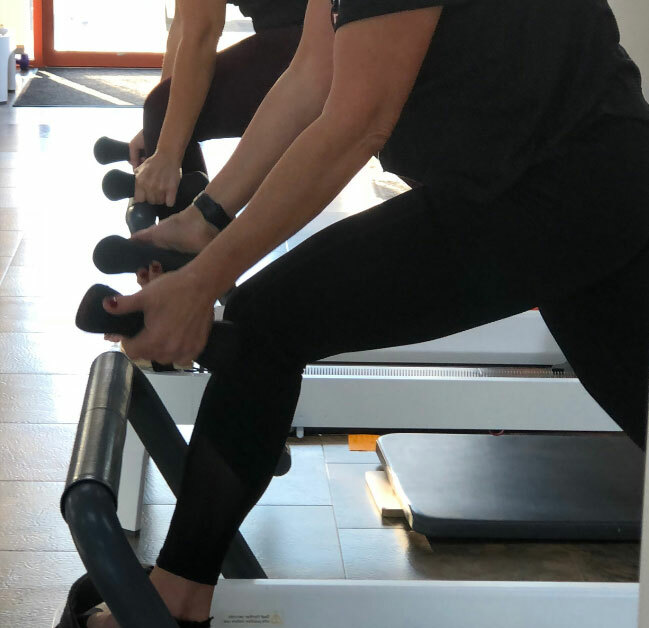 If you’re looking for a state-of-the-art Pilates studio in Omaha, look no further than Core10 Pilates. We offer a unique array of Pilates classes for men and women of all ages and fitness levels, and we would love nothing more than to show you the many health benefits of Pilates. If you’re interested in learning more about our Pilates studio, or you’d like to sign up for a Free Intro Class online, contact us today! The Hundred is a classic Pilates exercise that you will likely be asked to perform in the beginning of your class. This exercise hones in on the abdominals, lungs, arms, and legs. It can be very challenging to newcomers at first, but your Pilates instructor should be able to show you some modified positions. To perform this Pilates move, you will be asked to lay flat on your yoga mat, drawing both legs into your chest. Slowly stretch your legs out to a tabletop position, which your knees directly positioned above your hips and your shins parallel to the floor. Lift up your arms about three inches off of the ground, just above your abdominal wall, and start to pump your arms up and down while taking deep breaths. Inhale for a count of five, and exhale for a count of five, repeating ten times without taking a break. Another fun Pilates exercise that you will likely try during your first Pilates class is a move called Rolling Like A Ball. While this move may initially feel fun and silly, it is a simple way to simultaneously massage your back muscles while also working your abs and core. This is a great exercise for beginners because the rounded shape of your spine can help to teach you how to properly and effectively engage your core muscles. To properly come into this Pilates pose, come to a seated position on your mat with your knees bent and your feet pointed forward. Carefully grasp the back of your thighs with each hand and lift your legs up so they are off of the floor. Keep your knees about shoulder-width distance apart, and lower your head between your knees to tuck into a tight ball. Inhale and exhale deeply to engage your abdominals before you start to rock back and forth like a ball. Slowly rock back to your shoulder tips (never all the way down to your head or neck), and then back up, as you attempt to find your balance at the top. Repeat this exercise five times. Leg Circles are another abdominal-engaging exercise you will find in a Pilates class. To perform this exercise, simply lay down on your mat and extend your right leg straight up towards the sky. Keep your left leg bent with your foot placed flat on the floor. Slowly start to circle your right leg across your body to the left of your shoulder, then back around to your right shoulder, and stop at your nose. While you are performing this small movement, try to focus on keeping your abdominals scooped in. Repeat this five times before you switch your legs. The Single-Leg Teaser is a wonderful Pilates pose that can get your body prepared for more advanced moves. To perform this exercise, lay down on your mat and walk your feet a few inches towards your body. You’ll want the bend in your legs to be at a 120-degree angle, not right next to your hands. Slowly extend one leg out and focus on hugging in your inner thighs and knees. Reach your fingers to your toes and slowly start to round your body up towards your toes. On the way back down, roll down to your shoulder tips before you raise your torso back up. Repeat this movement on one side four times before you switch over to the next foot. This Pilates stretch is a great way to give some much-needed attention to the sides of your body. Not only can the Mermaid pose help relieve tension in your side-body, it can help you lengthen and stretch out parts of your abdominals and spine as well. To get into Mermaid, sit on your mat like a mermaid (with your legs folded together to the left side). Place your left hand around your ankles, and position your right arm straight up into the air. While keeping your abdominals engaged, reach your right arm towards the ceiling and lift out and over to the left side. You should feel a nice stretch along the right side of your body. Repeat this move twice, before switching over to the opposite side. We hope that these Pilates exercise descriptions prove to be useful as your prepare for your first Pilates class. If you live near Omaha and you’re looking for a friendly Pilates studio, be sure to visit Core10 Pilates today. We offer a free Saturday Intro Class for new students, and we would love to show you the amazing benefits that Pilates has to offer. Book a class online today or check out our Testimonials to learn more about our company!